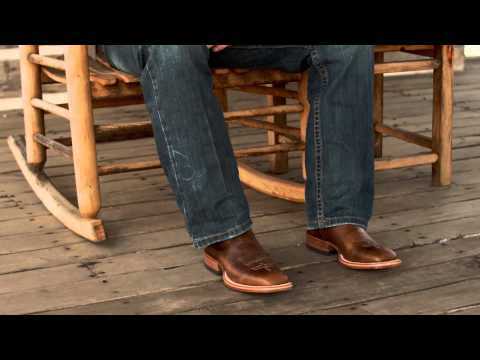 Stir things up in the stirrup with the 11-inch Ryman cowboy boot. Its distressed and weathered exterior gives the light brown leather a vintage feel and is accented by a teal and cream stitching and smooth brown leather panel on the heel. This classic boot features a double stitch welt for added durability and a square toe and unit heel allow for an easy fit in the saddle. The cushioned insole guarantees lasting comfort no matter how rough the ride.